Kitchens, who in eight weeks rose from unknown assistant to hot coaching commodity, became the seventh candidate to interview for Cleveland’s juicy job on Monday. Kitchens met with members of the club’s search committee led by general manager John Dorsey and including owner Jimmy Haslam, who were already impressed by what the 44-year-old did on an interim basis. Taking over play-calling duties on Oct. 29 when coordinator Todd Haley was fired, Kitchens transformed Cleveland’s offense while forging a strong relationship with quarterback Baker Mayfield, who set the NFL rookie record with 29 touchdown passes. Kitchens jump-started the biggest turnaround season in club history and may now get the chance to do more — or stick around as the team’s next offensive coordinator. The Browns think so much of Kitchens that they’ve denied other teams permission to interview him. He’s under contract, and if the club decides to hire another coach, it’s clear they want Kitchens around. He began the season coaching running backs before being promoted to coordinator when Haley and coach Hue Jackson were dumped following a loss in Pittsburgh. But once Kitchens got his hands on Cleveland’s offense, nothing was the same. The Browns improved in virtually every statistical category under Kitchens, who showed fearlessness and imagination in his play-calling. He employed a “Wishbone-type” backfield formation, had wide receiver Jarvis Landry throw several passes and had Mayfield pitch the ball to himself before completing a long TD pass in the season finale at Baltimore. With Kitchens in charge, Cleveland’s offense was balanced, unpredictable and exciting. 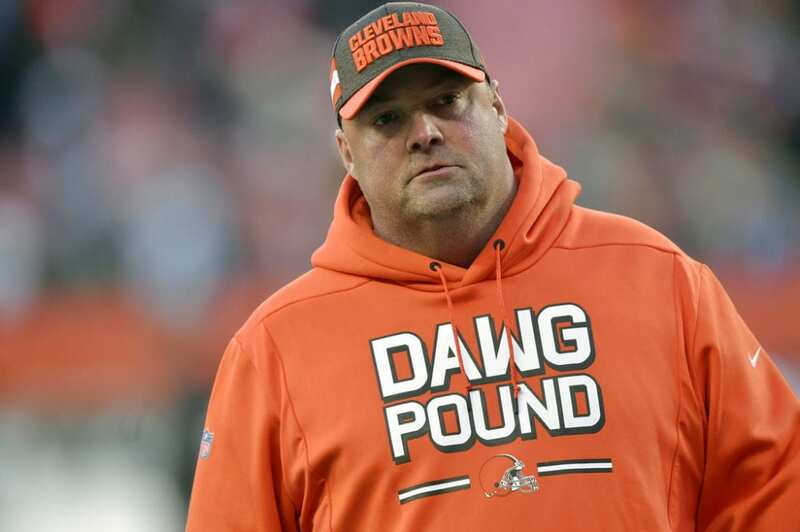 Kitchens never once campaigned to be Cleveland’s coach, but said leading a team was his goal. Kitchens’ resume stacks up with any of the other candidates Cleveland has met with so far. It’s possible Dorsey will meet with former Packers coach Mike McCarthy, but no interview has been scheduled. The Browns are very familiar with McCarthy, who worked with Dorsey, assistant GM Eliot Wolf and vice president of player personnel Alonzo Highsmith in Green Bay. Be the first to comment on "Browns Interview Coordinator Kitchens For Head Coaching Job"